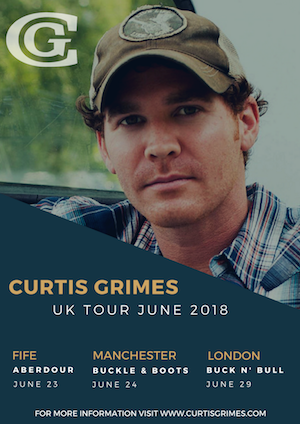 US country singer-songwriter Curtis Grimes has announced his first tour of the UK this June, with shows in London, Manchester & Scotland, and more dates to be announced. Grimes, whose recent single ‘Born To Die‘ became his latest #1 hit on the Texas radio chart last month, rose to fame among American audiences on season one of The Voice, and has since had over 14 million streams for his original songs, building a career as a national touring artist, headlining sold-out shows and opening for the likes of Aaron Watson and more. The 2016 full-length collection ‘Undeniably Country’ received highly positive reviews in magazines such as Country Music People (5*) and No Depression, who described it as an album that “most certainly lives up to its title”; and also includes the fan-favourite ‘From Where I’m Standing’, written by Thomas Rhett, Chris Janson, and Jaron Boyer (who wrote Cole Swindell’s recent #1, ‘Flatliner’); and ‘Right About Now’, one of the top five most streamed Texas/Red Dirt singles on Spotify with nearly 1m plays to date, co-written by Grimes with his producer Trent Willmon (Little Big Town, Cody Johnson, Randy Houser). His most recent album “Undeniably Country” was released in late 2016 and debuted at #16 on Billboard Heatseekers. The album was produced by Trent Wilmon and is Curtis’ most personal collection of songs to date, helping him break out of the Texas scene and reach a national country audience. Fresh off his 6th #1 Single, 2018 is shaping out to be a great year for Curtis Grimes, who visits the UK for the first time in June – tickets available now.